Since Dr. Daisetz T. Suzuki introduced Zen Buddhism to the Western culture after World War II, a great number of Christians and Catholics have engaged in this new religion-philosophy. Catholics in particular readily adopted Zen’s spiritual practice of self-awareness as a mean to deepen their faith and relationship with the Blessed Trinity, through the art of zazen and zazen sesshin. Apart from these two practices of pure meditation, Zen and Catholicism are distinctively unique in its own doctrines or teachings. Since the creation of mankind, human beings have been created with a quenching thirst whether it is for the Ultimate Truth, the Supreme Being or Self-Awareness. Such quests have led to remarkable religious breakthroughs: the enlightenment and state of nirvana by Siddhart Gautma (ca. 6 B.C. ), later by Bodhidhama (520 A.D.) and the revelation of the Kingdom of Heaven from Jesus Christ (0-33 A.D.). Zen Buddhism, as practiced by the warrior class in Japan during the 1400s-1600s, popularized Western thought after World War II through Dr. Daisetz T. Suzuki. Such an adoption by the West did not witness a wave of syncretism—the merging of two religions—for Western Christians and Catholics practice zazen only to deepen their religious fervor and convictions. Though very much alike in the practice of pure meditation, Zen and Catholicism possess no further doctrinal common ground. Comparisons between Zen zazen with Christian meditation and Zen sesshin with Christian Spiritual Exercises, re-establish the bridge of kinship between the worlds of the Oriental East and Western Civilization. Prior to 1300 A.D., Japan was a militaristic and feudal society, dominated by the samurai class. Men were aggressive and brutal; life was unrest. Then came the birth of Zen Buddhism on Japanese soil. Through the practice of Zen, Japanese warriors were able to overcome the curse of living under the shadow of death, the sword, as prescribe by bushido, a samurai code base on loyalty, honor, and justice. In fact, these knights acquire a transcendence of life and death (Lipski 36). Nevertheless, Zen Buddhism flourished during the Ashikaga Talauji’s shogunate (1336-1573) at Muromachi, a district in Kyoto. Zen Buddhism traces its lineage to Bodhidharma, an Indian Buddhist monk of the Mahayana sect (the greater vessel) or the Northern School of Buddhism, who first in 520 A.D. introduced the Four Noble Truths and Eightfold Path to the Chinese. From the mingling of Chinese Buddhism with Taoism, comes another sect of Buddhism, the Ch’an School of Buddhism and by 1200 A.D., this new religion-philosophy arrived in Japan as Zen Buddhism. The establishment of Zen Buddhism in Japan is attributed to two Japanese Buddhist monks, Master Eisai and Master Dogen, whom both studied in China. Upon their return, two main sects of Zen blossom on the Japanese archipelago. As the forerunner, Master Eisai (1141-1215) initiates Rinzai Zen in 1191, with great emphasis on the use of koan—logically insoluble problems aimed at transcending the intellect and stimulating pure intuition. In Master Eisai’s footsteps, Master Dogen (1200-1253), later established the Soto School of Zen. 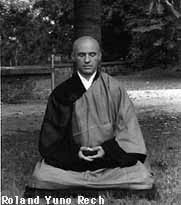 Unlike Rinzai Zen, Soto took a different approach to enlightenment through the art of zazen, or sitting in an upright position with legs crossed during meditation. Attracted to its austere discipline and practical approach, the medieval Japanese military class embraces Zen Buddhism as its way of life. The presence and practice of Zen Buddhism in Japan resulted in a harmonious state with innovated cultural developments such as poetry, calligraphy, ink painting, tea ceremony, and landscaping gardens. Although Japanese Zen witnessed a decline in the 16th and 17th centuries, it was miraculously revive by the great Hakuin (1686-1769). After World War II, Dr. Suzuki (1870-1956), a Japanese scholar, introduced Zen Buddhism to the West through his gift of the pen, most notably in his Essays on Zen Buddhism. The practice of zazen became popular among Christians and Catholics alike. Thomas Merton (Cistercian monk and theologian), Dom Aelred Graham (Benedictine monk), Tom Chetwynd (Catholic Zen teacher and author), and David Hackett (Catholic professor), to name a few, are among the rising number of Zen practitioners who have benefited from practicing zazen. Today, when one speaks of Zen in the West, there is no distinguish between Renzai and Soto. Zen is Zen. In comparing Zen to Christianity, Thomas Merton makes a erudite statement, “Zen is not Kerygma, but realization, not revelation, but consciousness, not news from the Father who sent his Son into the world, but awareness of the ontological ground of being here and now, right in the midst of this world” (Hart 168). Undoubtedly, Zen and Christianity are two separate religions, each with its own set of teachings or doctrines and practices. Because they are not on the same plane, Zen and Christianity do not conflict. Graham in his book, Zen Catholicism also points out that there is no harm in applying Zen insights into Catholicism. Furthermore, Pope John XXIII encourages Catholics to get a taste of Zen, as a mean to understand and improve one’s spiritual life (20-21). Though developed over 500 years apart and from different countries—Zen in India by Bodhidharma while Christianity emerges from Israel by Jesus Christ—yet, both possess parallel methods in obtaining their ultimate spiritual goal: enlightenment for Zennists and as for Catholics, perfect charity and holiness. Zen places the practice of meditation as the central tenet of its sect, whereas, Catholics strive for perfection and union with God through means of contemplative prayer. This pursuit for mystical union is best characterized by St. Augustine of Hippo’s prayer, “My soul is restless, O Lord, until it is rested in You.” As spirited human beings, we are constantly searching for the ultimate truth beyond this materialistic realm. The most common and preferable form of Zen practice is zazen. 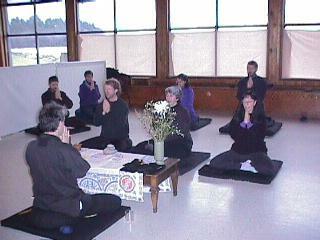 In order to endure a good half-hour to an hour of meditation, it is essential that one masters the techniques of a well balance posture, from the crossing of the legs, straightening of the back, casting downward of the eyes, to the placing of the hands in hokkaijoin (cosmic mudra) style. During zazen, one is to apply the attitude of “no-mind,” that is though in a state of consciousness, one does not concentrate on any particular object, or entertain any idea or emotions. Instead, one must allow the thoughts or emotions to pass by without leaving a trace. The essential goal here is to rise above one’s mundane nature to the height of pure intuition, of knowing thyself. Meditation and yet more so, Christian contemplation, takes on the same basic notion as zazen. The Christian art of meditation serves as a twofold function. First it allows one to have sufficient control over one’s mind and memory in order to recollect and withdraw from the exterior surroundings. Secondly, in silence and solitude it teaches one to come into the awareness and presence of God. In Christian spirituality, meditation is a lower form of prayer, in which one reads an excerpt from Sacred Scriptures or any spiritual book and then mentally imagine the scenario or ponder the text in earnest prayer to discover God’s will and truth for one’s life. More so, zazen is closer in relations to the act of contemplation, for Christian contemplation is “the highest expression of man’s intellectual and spiritual life” simply because it permits one to grasp the Source of Life beyond reason and simple faith (Inchausti 166). Here, a devout pray-er—with his whole body, mind and soul—lovingly gazes upon the Lord in a state of intimate union with Him. He thus, becomes a second Christ, for “Christ lives in me,” echoes Paul in Galatians 2:20. Zen Sesshin, a week long of intensive zazen is almost identical to the Jesuits’ Spiritual Exercises which last as short as three days to as long as a month’s period. This Catholic practice is intended to direct the individual’s will to a change of heart, to reform one’s life and to ascend to a new level of spiritual piety and holiness. However, the eight-day Spiritual Exercises retreat fits the picture perfectly here. Besides the duration, there are at least four other similarities worth now examining. In The Silent Dialogue, the author printed a sesshin schedule that he had attended. Accordingly, there are an average of ten 30-40 minute zazen daily, a total of ten plus hours of meditation per day and for seven days, a person in attendance spends more than 50 hours of sitting meditation (Hackett 41). This explains why Hackett, the author and many other Zen disciples would take months and even years of disciplining themselves to such intensive sitting and “no-mind” thinking. Nonetheless, hard work does reap satisfactory results. In fact a person’s life is changed, sometimes 180 degrees thereafter. They perceive life through new lens, the lens of enlightenment. Likewise, the eight-day Jesuit retreat calls for at least four to five hours of meditation or contemplation each day, broken down to modules of at least an hour each. Even though the Spiritual Exercises does require constant spiritual discipline, it is not as strict or rigid as sesshin. A second common factor is the emphasis of silence. Profound silence is observed throughout both retreats. The locations of such events also contribute to the peace and serene atmosphere, for instance, at a secluded area in the woods or mountains. For it only in the silence of the exterior that one is lead to the solitude of the interior. Hence with such purity of mind and soul, one has a better chance of achieving satori, an experience in enlightenment or mystical union for Catholics. According to Zen, words have no meanings, for words cannot fully convey the mysterious experience; it is ineffable, beyond the human tongue. Christian mystics also have a difficult time in expressing their ecstasies and heavenly espousal to Christ himself. Even if they had the ability to relate such experiences, can the human mind fathom it all? Thirdly, one is lead through a spiritual and psychological healing during these seven or eight day meditation. As for sesshin, one undergoes a process of purification and conversion. The Zen master direct the student to a state of awareness—the body is defiled by sinful acts of filth and evil passions. Therefore, it must be liberated from the four realms of evil: hell, the world of hungry spirits, the world of animals, and the world of fighting demons (Kadowaki 132-133). From this state of realization, the Zen disciple embarks on an ego metamorphosis. Hence, conversion and a rebirth take place as one “make a holy vow to be emancipated from delusive passions and attain Buddhahood without fail and to observe the teachings of the Buddhas and Patriarchs” (ibid). Also at the end of the same spectrum, the Spiritual Exercises allows the retreatant to reflect upon his life in the light of Christ’s PDR—passion, death and resurrection—starting with the acknowledgement of sin and its impact on one’s spiritual well being. This method of mirroring allows the retreatant to experience a Christian rebirth, a change in heart, just as King David had prayed for in Psalm 50, a heart of flesh filled with compassion and contrite to replace the heart of stone. Last and by no means least, is the parallelism between dokusan (a private interview) and spiritual direction. The student or directee is required to come and see the Zen teacher or in the Catholic case, the spiritual director, once daily to discuss any difficulties he may encounter during prayer and/or meditations or to have any unanswered questions resolved. Since it is a one-to-one conference, it is very beneficial on the disciple’s behalf. In addition, this meeting period also gives the teacher or director an idea of where the retreatant is at in his search for the ultimate truth or the will of God and hence, keep him on track. Almost 60 years have passed since the first acquaintance of Zen Buddhism in the Western hemisphere. Due to curiosity and word by mouth, Christians (and Catholics) continue to apply Zen insights and practices because of its money-cannot-buy results of individual peace and harmony. Besides the similar practices of Zen zazen and sesshin with Christian contemplation and Spiritual Exercises, there exists virtually no further orthodox common ground. The Catholic Church has confirmed this teaching during the Jubilee Year 2000 in the Dominus Iesus declaration, that the Catholic Church alone is the one and only true church instituted by Jesus Christ himself and no other religion can claim a co-status. The increasing presence and influence of Zen in Catholicism today indeed paves the way for future interfaith dialogues between the Ancient religions of the East and the Catholic Church. As for Catholics—while still holding fast to their faith and obedience to the Church Magisterium, teaching authority—there is much to learn from Zen and its ancient practices, specifically its methods of attaining pure knowledge as a mean to assist one’s prayer life. This is the key to a deeper awareness of the self, the world and world peace. One cannot ignore, but muse on the words of Thomas Merton right before his sudden death in Asia in 1968, “Zen and Christianity are the future” (Lipski 32). Chetwynd, Tom. Zen and the Kingdom of Heaven. Boston: Wisdom Publications, 2001. Eusden, John Dykstra. Zen and Christian: The Journey Between. New York: Crossroad, 1981. Graham, Dom Aelred. Zen Catholicism. New York: Crossroad, 1999. Hackett, David G. The Silent Dialogue. New York: Continuum, 1996. Hart, Brother Patrick (ed). Thomas Merton/Monk: A Monastic Tribute. Kalamazoo, MI: Cistercian Publications, 1983. Inchausti, Robert. Thomas Merton’s American Prophecy. Albany: State University of New York Press, 1988. Lipski, Alexander. Thomas Merton and Asia: His Quest for Utopia. Kalamazoo: Cistercian Publications, 1983. Kadowaki, JK, SJ. Zen and the Bible: A Priest’s Experience. London: Routledge and Kegan Paul, 1982.